Are you looking for a bulldog puppy that will love you unconditionally and bring laughter and happiness to your household for years to come? If so, Legends of Denmark has the perfect bully for you. We are english bulldog breeders that offer a selection of adorable, friendly, and personable English bulldog puppies, all of whom are looking for an approved home. We are in Jacksonville, Florida, at (904) 627-0304 for endearing and loyal English bulldogs for sale. Don't forget to check out NuVet Plus supplements, supplements recommended by our breeders that will help your bulldog live a long and healthy life. 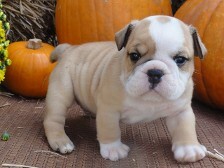 At Legends of Denmark, we specialize in breeding the finest English bulldog puppies in the entire country. We are bulldog breeders who carry puppies that boast only the highest pedigrees from the most sought-after bloodlines in America. To learn more about our latest selection of puppies for sale, contact us today by phone at (904) 627-0304 or via email at legendsofdenmark@aol.com. Known for their loose-jointed, shuffling gate and massive, short-faced head, the Bulldog is known to be equable, resolute, and dignified. As a medium-sized dog, they are not your typical lap dog—but they would like to be! They are one of the most popular breeds according to AKC registration statistics due to their lovable and gentle dispositions and adorable wrinkles. 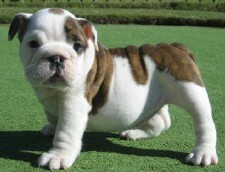 The bulldog may be brindle, white, red, fawn, fallow, or piebald. 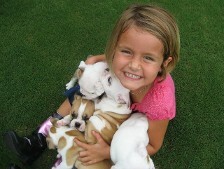 Our family has been breeding bulldog puppies for more than 5 years. During this time, we have been able to breed numerous puppies that are champion sired from National BISS show winners. 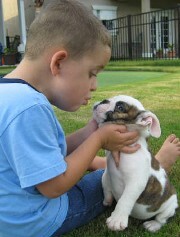 Plus, since our bulldogs are raised in a warm and loving environment, they are always friendly and personable. Call today to learn more about our selection of puppies for sale. Said to have originated in the British Isles, the name "bull" was applied because of the dog's connection with bull baiting. The original bulldog had to be ferocious, courageous, and almost insensitive to pain. When dog fighting became illegal in England, fanciers set to the task of preserving the breed by eliminating the fierce characteristics. 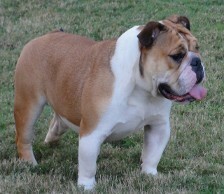 Within a few generations, the bulldog became one of the finest physical specimens with an agreeable temperament. Although the English Bulldog's appearance can be somewhat intimidating, it is among the gentlest of dogs. 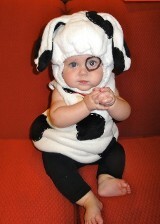 All the same, it will see off any intruder and few would risk a close encounter with a dog brave enough to bait a bull. It is described as a very affectionate and dependable animal, gentle with children, but known for its courage and its excellent guarding abilities. Bullheaded and determined, this breed can be very persistent. They do not give up easily. Bulldogs are definitely a people's dog, seeking out human attention and loving every bit it can get. A lot of human attention is required for the breed's happiness. 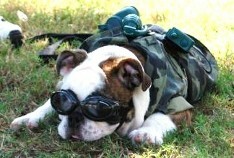 When bulldogs are young they are full of energy, but they slow down as they get older. 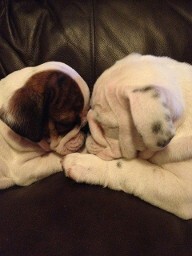 As experienced bulldog breeders please contact us to find the right bulldog puppy for your family.